Time is going by so quickly. I think it only gets worse as I get older. It’s already Wednesday! 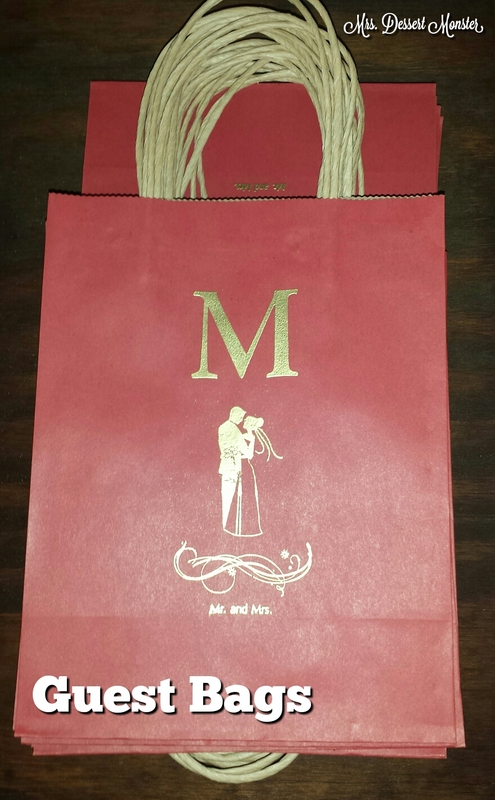 Today I wanted to share the guest bags I made for the wedding. I was inspired by some awesome gift bags I saw on Pinterest & knew I wanted mine to be at least a little bit special. But I also wanted them to be relatively inexpensive. I saw these paper gift bags at the Dollar Tree 2 for $1. I figured I could draw on them or use stamps or something. Then, when I ran the idea past my friend Beth she suggested embossing. She embossed all her own wedding invitations & became something of an expert at it. This type of embossing is really easy & looks really pretty. Beth has an embossing tool, which is basically like a hair dryer. The way it works is simple: you take a regular rubber stamp & ink, stamp your design, pour the powder on it, shake off the excess powder, & use the embossing tool to melt the powder. It’s really neat! We had a little assembly line going & knocked out 20 bags in no time. OK so the bags are pretty, but what did we put in them? Well, I didn’t know I was going to have this blog at the time so I didn’t photograph the contents. Sorry guys, I dropped the ball there. But it was pretty standard stuff: water bottle, mini hand sanitizer, advil, lint roller, candy canes, ghirardelli peppermint bark, other candies & a little bottle of tequila (of course!). Every individual thing was $1 or less. I think the bags cost me about $4.50 each. I love the Dollar Tree. 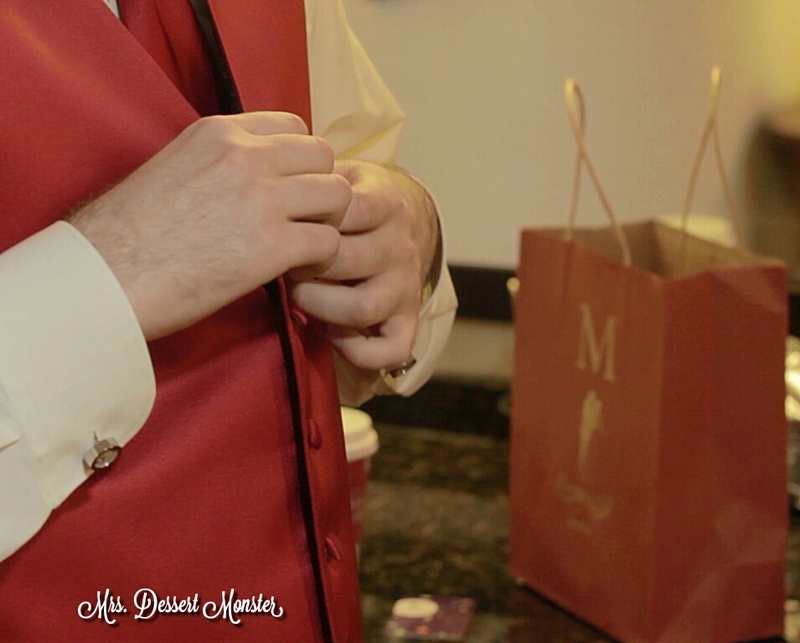 I also love the screen caps I’ve been able to grab from our wedding video! This is as close as I have to a professional picture – from a professional moving picture! The guys happened to have a couple of bags in their room when they were getting ready. I think our out of town guests appreciated the little token, & packing them was just one more little thing my husband (then fiance) & I got to do together to get ready for our big day. See y’all next week! It’ll be here before you know it. I haven’t thought about embossing — great idea!